Dai Ngan Restaurant in Ha Noi is a haven for vegetarians. Offering free food, it permits diners to choose their own meals and eat as much as they like. Here, at 3 Nguy Nhu Kon Tum Street, Thanh Xuan District, the key word is "happiness": The owner is happy to receive guests, the guests are happy to get a free lunch and the waiters are happy to serve, despite not receiving a salary. Tran Van Thai, who opened the restaurant, was once a businessman from the northern province of Tuyen Quang. His company, which sold wood, was quite famous during its heyday. However, due to mismanagement, it went bankrupt, leaving Thai buried in debt. As a result, he faced numerous problems and suffered a crisis of faith. To recover his sense of balance and calm in the midst of his troubles, he decided to move into a pagoda for a while. "During my time at the pagoda, I lived like a monk," he said. "The chief monk taught me a great deal about his philosophy of life and the principles of cause and effect, as well as giving and receiving. "'Why don't we help each other when we're healthy and well-off?' he asked me. 'Only when someone falls ill and is admitted to the hospital do his/her relatives and friends visit. By then, it's too late. Why don't we come sooner to share with each other much more than sorrow?'" The monk's advice remained etched in Thai's mind. When his family helped him to clear his debts, he left the pagoda and turned his life around. "Instead of trading and gaining profit for myself, I wanted to do something to help other people and bring them a little joy," he said. "I wanted to give people a chance to buy fresh, clean vegetables and meat at cheap prices, and I also wanted to offer a free lunch every day. "Everything I do stems from the desire to make other people smile. I feel peaceful and happy when I can make others happy." Twenty workers arrive at the restaurant at 6am to prepare the food for the day. They quickly assign tasks to each other, clean the vegetables, wash the dishes, cook, and lay the tables. The dishes are ready to serve at 11am. The restaurant is soon packed with diners who slowly select seats and choose their favourite food. Thai welcomes them with a smile. He greets newcomers who are often shy and wondering whether the meal is really free, directing them to an empty space where they can enjoy their meal. Guests can choose anything they like from the menu, which serves up some 50 veggie dishes, bulbs and mushrooms in a huge variety of dishes. The ingredients are supplied by Thai's 60ha farm in Ba Vi District on the outskirts of Ha Noi, where he grows organic vegetable and raises up to 1,000 pigs. The farm itself is a success story, with its turnover some VND130 billion (US$1.5 million) per year. Thai used part of this income to open an organic food shop in Ha Noi in addition to Dai Ngan Restaurant. When the diners at the restaurant finish one plate of food but are still hungry, they're encouraged to take another helping. ThaF9i does recommend not taking more than they can consume though. "We receive about 200-300 guests per day," Thai said. "I tell people that if they are satisfied with the food, they can invite their friends to have a vegetarian party here. It's free for everyone." Thai often eats with the diners, sharing his knowledge of vegetarianism. He also discusses the benefits of a healthy diet. Every day, Thai happily serves the people, receiving gratitude and smiles in return. The restaurant is open to people from all walks of life: workers, office workers, students, and housewives, whether rich or poor. Here, everyone is equal. The diners serve themselves and leave their empty plates in the prescribed area. "Many people come here for more than just the free food. They aren't too poor to buy a meal for themselves. They come to enjoy a shared meal," Thai said. "Many of them leave a sum of money to help defray the cost of running the restaurant. They want other people who are less fortunate than them to have the chance to get a free meal, filling their stomachs with food and their hearts with kindness." Nguyen Van Dang, who works as a security guard for a company on Khuat Duy Tien St., said he has eaten at the restaurant several times. "The food is good," he said. "Even though the restaurant offers free food, the customers are served with thoughtful consideration. "The waiters are polite and friendly. They never forget to offer me tea and fruit for dessert after the meal." 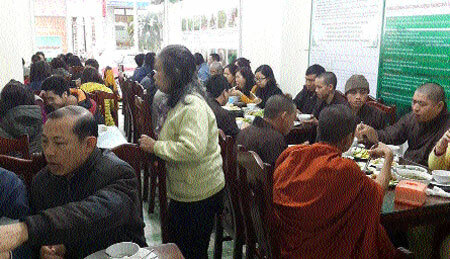 The spirit of kindness turned out to be infectious, as retired women and students began to sympathise with Thai and decided to help him serve the guests, without expecting a salary. Tran Thu Oanh, a retired middle-aged woman serving at the restaurant, said she had often felt bored and didn't know what to do with her free time before joining the restaurant. Her role of cooking delicious dishes along with hearing the diners' praises when they receive a good meal free of charge bring her great satisfaction.